The TeMeDa API Portal provides a comprehensive list of RESTful JSON-based APIs that allow TeMeDa customers the ability to securely view, analyze and manage their telemetry devices and data. Developers can use this portal to discover and learn about the TeMeDa API. Just sign up for an API key and start consuming this API right away! Check out the TeMeDa API Documentation that describes how to use our RESTful APIs and includes code samples in multiple programming languages. The API Console allows you to directly interact with the API right here in the developer portal. The TeMeDa API Portal is also home to the AT&T Equipment and Machinery Solution API. Start now by viewing the Overview and Getting Started documentation. 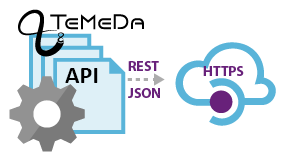 Developers can test each API operation with a "Try it" button and see the JSON results immediately. Developers can also log and discuss issues with TeMeDa customer support in the Issues section of the portal. Click the "Sign Up" button above, then subscribe to an API Product to get your Subscription Key and access to your TeMeDa API account and telemetry data.